“We are Student Leadership Fellows with the Community Engagement program at Shasta College. 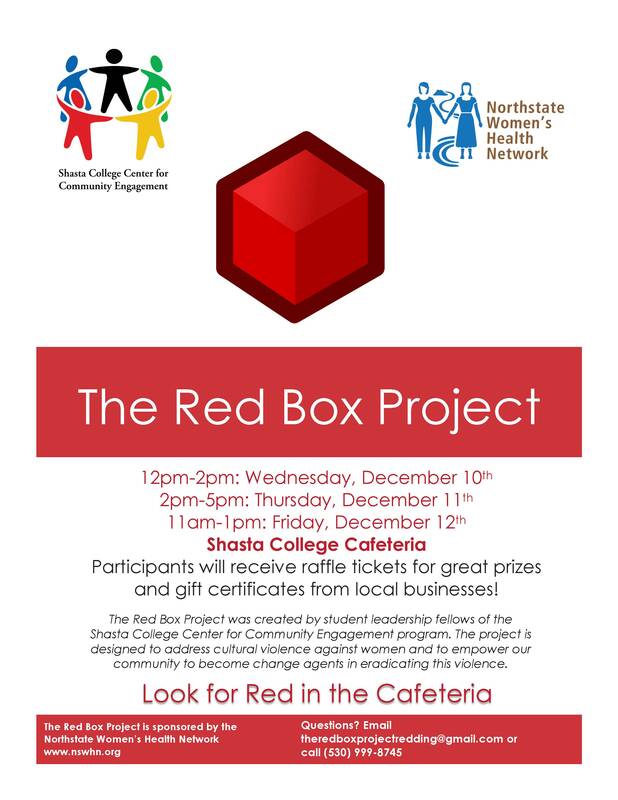 Our work in the Fall 2014 semester is The Red Box Project. Our mission is to address cultural violence against women and to empower our community to become change agents in eradicating this violence. With The Red Box Project, we will provide information and practical tools to aid in the transformation of underlying beliefs that lead to sexist behavior and attitudes. We believe that this project will be beneficial to our community by shining a light on the many ways that sexism feeds violence against women and sharing the empowering message that each member of our community can become a catalyst for social justice. If you’d like to participate in The Red Box Project, please contact theredboxprojectredding@gmail.com or (530) 999-8745. Follow and Submit Your Email! Enter your email address to follow this organization.